With over 100 delegates, this international event brought together people from a range of disciplines and backgrounds: linguists, psychologists, anthropologists, speech pathologists, educators and parents of bilingual children. It thus allowed for great networking opportunities and the chance to reflect on a range of bilingual acquisition perspectives. We heard about current research on the factors that enhance or impede bilingual language development, and the implications for theories of language acquisition, education and clinical practice. Keynote speakers included Professor Erika Hoff (Florida Atlantic University), Professor Theo Marinis (University of Konstanz), Dr Carmel O’Shannessy (Australian National University), Professor Johanne Paradis (University of Alberta) and Professor Gillian Wigglesworth (University of Melbourne). Eight other papers and sixteen posters were presented by researchers from around the world. All sessions were well-attended with lively question times and great discussions during poster sessions. One attendee commented that the workshop was “a fantastic model” in how to disseminate research to a broad audience. We look forward to continuing collaborations that enable our research to reach diverse audiences and inform educational and clinical practice as well as theory. 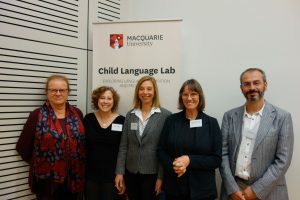 The workshop was sponsored by the Distinguished Professor Katherine Demuth’s ARC Laureate Fellowship (FL130100014) and the Child Language Lab, the ARC Centre of Excellence in Cognition and its Disorders (CCD) and the Macquarie University Centre for Language Sciences (CLas).